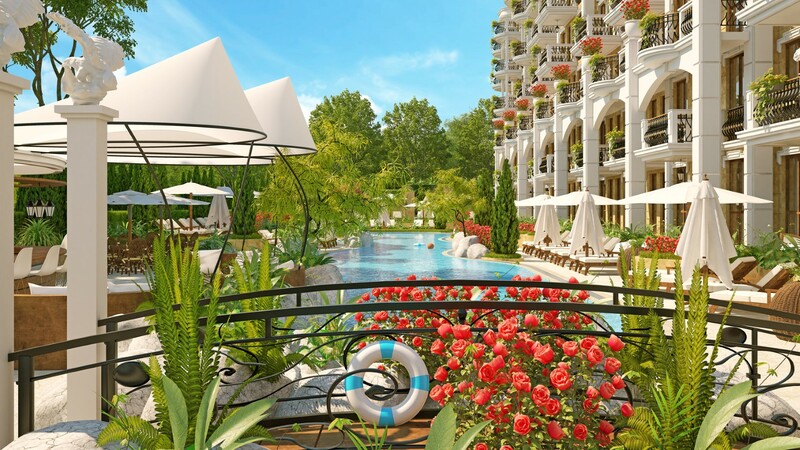 The luxurious residential complex Harmony Suites 11, 12 is located in Sunny Beach’s best spot. It will provide you with a superb accommodation on the Black Sea coast, close to all necessary amenities for a year-round living. Harmony Suites 11, 12 is а part of the largest Harmony Suites project, consisting of five state-of-the-art complexes. The greatest benefit for you and your children is the perfect relaxation place in fully equipped, green park of the complex. Buying an apartment in Harmony Suites 11, 12 makes you an owner of a green oasis where your only worry is where to chill and relax during the day. And with a golden beach, multiple facilities, and inviting swimming pools – all nearby – one thing is certain – you’ll be pampered! Hydrolysis and electrolysis system for swimming pool sanitation. You would think that luxury like this will cost you a fortune, but you couldn’t be more wrong. By investing in Harmony Suites, you’ll have your own affordable luxe. Maintenance fee – depending on the size of the property (12 EUR per sq. m per year). IMPORTANT: Each payment plan is discussed individually with each valued client, according to his/her desires. Your comfort is the most important to us. That’s why all air conditioners in the new complex are Daikin – the world leader in the production of air conditioners. Interested in owning a luxurious property in Harmony Suites 11, 12?